It’s time to announce our etsy.com gift card winner! I let Daisy pick names out of a bowl this time . You know she’s objective – she can’t read yet – aaaaaannd the lucky winner iiiiiiiiiiiiiiiiiiiiiiiiiiiiiiiiiiis………..
Choc Chip Uru of gobakeyourself.wordpress.com! Congrats, sweetheart! Hope you enjoy your li’l online shopping trip. There’s no butter in my fridge. It’s not because I’m on some kind of health-nut diet. You know me better than that. It’s actually because I’ve been doing a lot of baking lately. The more-than-usual lot. This makes Shawn a bit nervous. How’s he supposed to stay slim with so many tempting sweets around? Every year, I bake a new type of cake for his birthday and he deserves the attention. This tradition came about when we first started dating. It was a time long before food blogs and the internet at your fingertips. The first year, it was a Coconut Macaroon Strawberry Shortcake. Next was The Year of the Failed Prinsesstårta. As complicated as its name, that one earned its place in newspaper headlines – it was a sheer disaster. I tried and tried to make that cake. And, the more things went wrong, the more determined I was to get it right. Well, I must’ve wasted 70 lbs of flour, $90 worth of marzipan and 482 eggs. But, that was a loooong time ago. I’ve now got skills (Who says? ), the goods (a lot of baking stuff) and even more motivation (because, old people are really stubborn). This birthday cake was going to leave all the others in the dust. Weeks of planning had gone into play. Miss Daisy and I had been holding power meetings over weekend breakfasts for months, discussing all the details…the gift (a new desk from me and a lovely lamp and Aussie candies from Daisy), the menu, table decor, venue, etc, etc, etc. Scouring food blogs, cooking magazines, chef websites, cookbooks, we were looking for something over-the-top, something to make Shawn’s face light up. Thinking about interesting food I’d have, I remembered Houston. I nearly busted a rib. Look, I’m all for innovative food, but nothing foofoo. One look at Daisy and it hit me: Keep it simple. 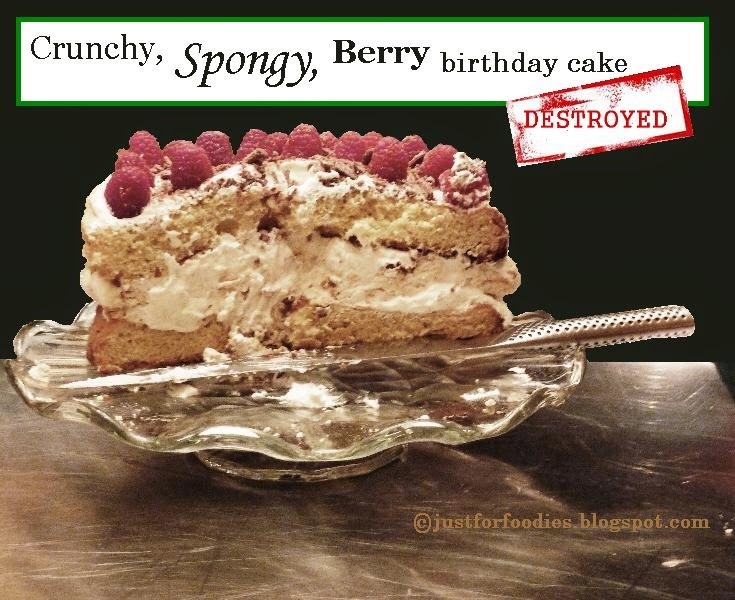 We’d put two favourites into one: Sponge cake & Pavlova (crispy meringue). And, I could bake each ahead of time, assemble at the last-minute. It was a winning idea! Shawn’s birthday officially fell on a Wednesday this year. There wasn’t much time for baking. Mom & Dad came over to watch Daisy. We went to a bistro for a cozy date. When we came home, Daisy was already asleep. So, the four of us celebrated with a beautiful mini cake I’d picked up from a nearby bakery. Saturday was the official celebration and I was really looking forward to it. A big day was in the works to have a dinner & movie night with the kids and the rest of the family. In the morning, my sister Nat & I reported to cooking class with Mom. We learned to make fesenjan, a classic Persian dish of walnuts, pomegranate syrup and chicken served over fluffy rice. Mom also taught us to make Grandma’s curry, a mild take on an Indian classic. I’ve made this one on my own a dozen times and it never turns out like Mom’s. but just plain ol’ onions browning in olive oil smell crazy good! Thanks to Mom, dinner was ready, but there was still so much to do. Somewhere in that crazy, busy day, I had to make his double-the-goodness cake. This “beze” cake, as it’s called, has come into vogue here in our little town. Apparently it’s nothing new in Eastern Europe, but I’ve only recently discovered it. A crispy meringue sandwhiched between luscious layers of smooth custard and fluffy cake. but honestly, I wasn’t sure I’d pull it off. what was I going to do with all those egg yolks?! It’s not like me to be pessimistic. So I pulled up my sleeves and went right to work. I had two full-proof recipes. To manage the sweetness, I decided to forego the custard and do a simple light whipped cream filling instead. My niece & nephew helped Shawn with the candles and we cut right into the cake. It was a hit! Crunchy, soft & spongy, a tinge of tart from the raspberries with just right amount of sweetness. Grease and flour two round 8″ cake pans. Beat egg whites with a pinch of salt until stiff peaks form. Gradually add sugar, then egg yolks. Divide batter between the two 8-inch round cake tins. Remove from oven and but leave cakes in tins for 10 minutes. Remove them from the tins and cool over a metal rack. tin to form a circle of the same size. Flip the paper over so that the marking is on the bottom and place the paper onto a cookie sheet. Whip egg whites until soft peaks form. Then gently incorporate the sugar until shiny. Finish w the vinegar. Gently spread the egg-white mixture into the circular space outlined on the wax paper. Bake for about 20-25 minutes, until the Pavlova is crispy on the outside, but spongy on the inside. Whip the heavy cream until soft peaks form. Gently add the powdered sugar and vanilla. Place one of the sponge cakes onto a cake plate and smooth 1/3 of the whipped cream on top. Place the meringue/Pavlova over the cream and top with another smooth layer of cream. Top with the second cake and smooth the last of the whipped cream. Arrange fresh berries and sprinkle with shaved chocolate. Now you’re a rockstar. This berry Pavlova Sponge cake is quite out of character for me. It’s not the usual easy, quick number. But, on the plus side, no advanced degree in astrophysics or civil engineering is required to bake it – just some patience. You also need someone very special in your life, someone who deserves all the fuss. In honor of Shawn’s birthday, I’m offering a $10 gift certificate to etsy! 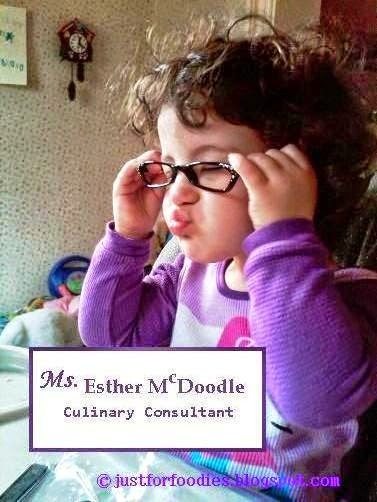 It’s my fav online marketplace, bursting with one-of-a-kind items, like cute clothes for kids made by stay-at-home moms and even edible goodies. All you have to do is tell me what’s your favorite birthday cake. This contest IS open to my overseas friends. Aussie Posse welcome! Winner will be selected randomly and announced on Thursday, February 28th. I didn’t marry for money. We don’t have a butler nor any Italian beauties nestled in a 10-car garage. But at the end of the day, when I leave my dingy cubicle and walk through the front door, I can’t help but smile with excitement. Our fox terrier Milou comes running and jumping to say hello. (provided there’s no Dora or Pingu on TV, of course). Then, I get a nice warm hug from Shawn, because I married for love. « Orange Sweetness: Who Dunnit? There was a birthday in my home this week, too. My son asked me to make him a “giant chocolate cookie sandwich stuffed with cheesecake.” My favorite birthday cake is plain chocolate with fudge frosting. I asked for that over and over as a little girl. Carrot cake all the way! On my birthday, I gotta have chocolate cake with chocolate frosting! But I've always been a fan of strawberry Pavlova! Liz, make just the Pavlova – it's quite easy. I love chocolate with peanut butter icing! That cake sounds wicked good! Hi, Ally. Boston Creme might be next. I've never ordered food from Etsy but that would be fun to try! That cake looks sensational Colette. What a great idea…love the play of textures and flavours. My fave has to be an espresso mascarpone birthday cake, but I'm kind of leaning towards this beauty here. It's gorgeous!! Thanks, Deeba doll. I love espresso + mascarpone! good job on the cake especially since it is so “customized” to your family. i actually am not a cake “liker” in the least so i have no favorite b'day cake. give me a good old fashioned crisp warmed up w/ perhaps – or not – a little ice cream on top and i'm a happy camper. Crumbles are wonderful, especially w ice cream. This cake sounds awesome! I love Nigella… I make her Guinness cake every year for St. Party's day! My husband gets requests from his employees for my rich, moist chocolate cake (recipe provided by friend) with my very own sweet, creamy mascarpone frosting! Created that myself because the traditional frosting of butter and confectioners sugar was too sweet for my son – mascarpone was the perfect solution! Added a bit of velvety creaminess, cut down on the sugary bite and a splash of vanilla added a gourmet sweetness nothing else can provide! Recipe is in my blog. I'm looking up your recipe right now, Meghan! I'm anxious when I'm out of butter! I buy a few pounds a time. 🙂 Needless to say, the Pavlova looks soooo divine! Thanks for stopping by my blog so i could find yours. 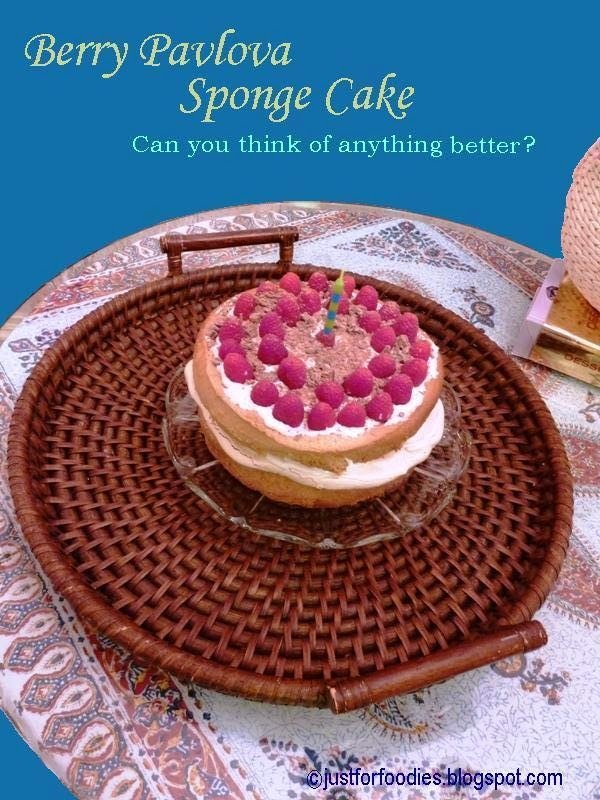 i started to bake about tow years ago but I am still struggling putting together a good sponge cake. 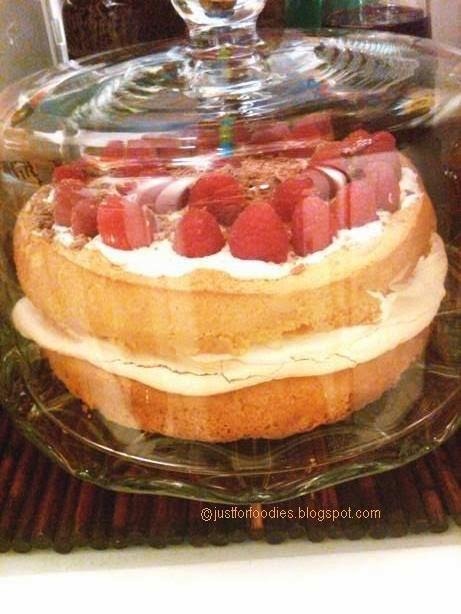 I love your detailed recipe and would love to try this Pavlova cake. Thanks for sharing the recipe and I can't wait to check out your other recipes!! Okay the cake is divine and your family photos are fabulous. Love your site. Thanks Yi. Both recipes are easy. Let me know how you like them. Love your posts, KimBee, too! 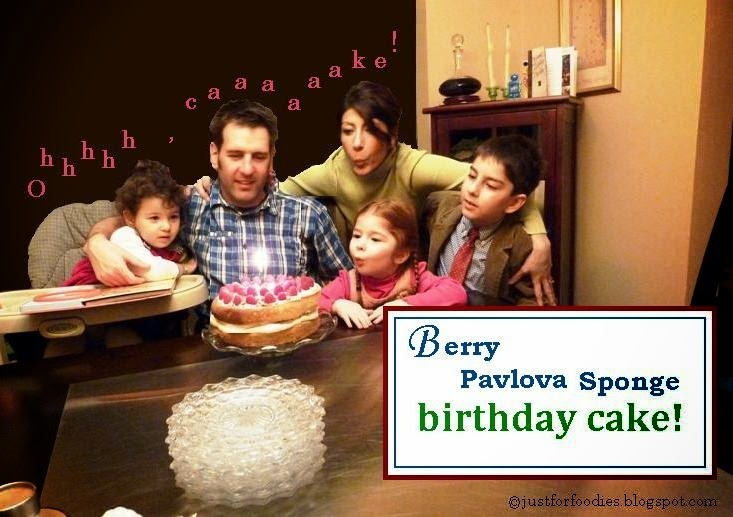 I adore pavlova so the thought of it in a cake sound amazing! Beautiful! I'll make one for your bday!